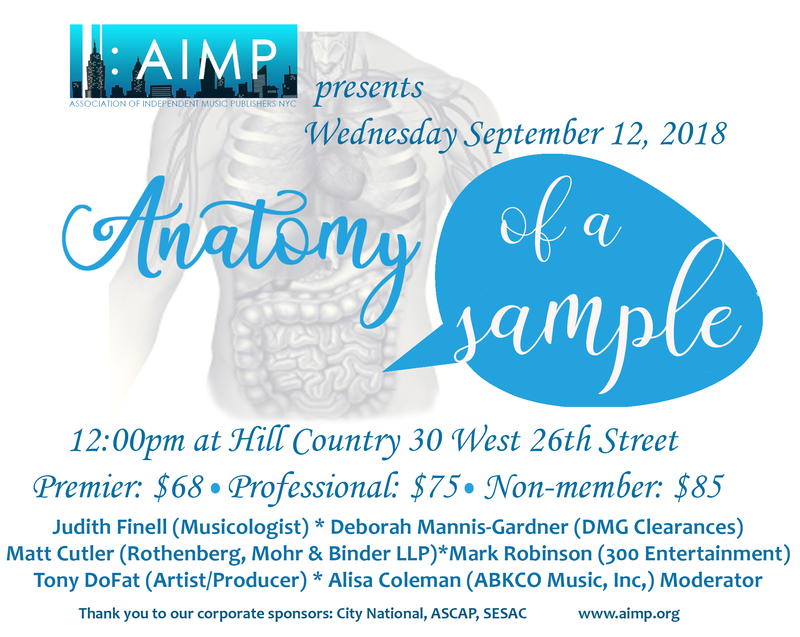 Anatomy of a Sample – Join AIMPNY at Hill Country for lunch and a review of the creation of a new song with a sample. The spirited discussion will review the process of a producer/songwriter, and the further clearance of the sample by the clearance company, attorney, musicologist, music publisher and record label. We will delve into the legalities surrounding the sample process – pros and cons of re-recording masters and how that may effect publishing rights, splits, contract requirements and registration issues. Premier Professional members should email Becca@aimp.org to take advantage of their discount on this event. Other members or non-member guests may register for this event using the link on this page. This is a pre-paid event and we must receive payment by September 7th or your reservation will be cancelled. Non-member guests should register at our website to provide email contacts information.